(a) Draw a graph to indicate qualitatively the nature of variation of the displacement of the proton with time from the instant of projection to the instant it returns to the point of projection. (Take the time t along the X-axis and the displacement s along the Y-axis). Explain why the shape of the graph is as shown by you. 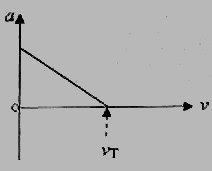 (b) Draw a graph to indicate qualitatively the nature of variation of the velocity of the proton with time from the instant of projection to the instant it returns to the point of projection. (Take the time t along the X-axis and the velocity v along the Y-axis). Explain why the shape of the graph is as shown by you. (e) Another proton was projected simultaneously from point B with the same speed u along the negative X-direction. The first proton arrived at the point A in time t1 and the second proton in a shorter time t2. If a third proton is released (from rest) at the point B, determine the time required for it to reach the point A. (a) The required displacement–time graph is shown in the figure. This is a case of uniformly accelerated one dimensional motion. The proton being positively charged, the acceleration of the proton is directed along the negative X-direction (which is the direction of the electric field). Acceleration has magnitude Ee/m which is constant. The magnitude of the velocity of the proton goes on decreasing. At the point C the velocity becomes zero and then gets reversed. Thereafter the magnitude of the velocity (along the negative X-direction) goes on increasing. The displacement-time graph is therefore non linear as indicated. 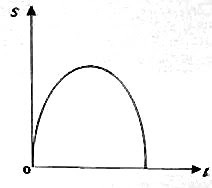 (b) The velocity-time graph is linear since the acceleration is constant. At the instant of projection the velocity is positive and has magnitude u. At C the velocity is zero as explained above. The lower portion of the graph shows the reversal of the velocity and the increase in its magnitude linearly in the opposite direction. ut1 – (½)at12 = – ut2 – (½)at22. Here a is the common acceleration (Ee/m) which is in the negative X-direction. The initial velocity of the second proton also is in the negative X-direction. (a) Assuming that the acceleration due to gravity g is constant throughout the path of the ball, draw a graph to indicate the nature of variation of the acceleration of the ball with its velocity. Take the velocity v along the X-axis and the acceleration a along the Y-axis. Incorporate all possible values of velocity in the graph and give the reason for the shape of the graph. (b) Write a differential equation for the acceleration of the ball. (c) Solve the differential equation you have written in part (b) to obtain the time-dependent velocity of the ball in terms of the given parameters and fundamental constants. (d) From the expression for the velocity obtained in part (d) obtain the terminal velocity of the ball. Justify your answer giving two important reasons. (a) The net force on the ball is mg – bv, taking the downward gravitational force mg as positive. The drag force bv is opposite to the velocity v and is therefore negative. Initially the velocity is zero and there is no viscous drag so that the acceleration is equal to g. As v increases, the acceleration a decreases linearly and when g = (b/m)v, the acceleration becomes zero. (This is the case of the magnitudes of gravitational pull and the viscous drag becoming equal). The ball then moves with a constant velocity (Terminal velocity). The velocity cannot increase beyond this value since the net force is zero. This gives – (m/b)ln[g – (b/m)v] = t + C where C is the constant of integration which can be found from the initial conditions. (1) The viscosity of water is much greater than that of air. In other words, the constant b is much greater. (2) The force of buoyancy in water is very much significant where as that in air is negligible. The force of buoyancy counteracts the gravitational pull, thereby reducing the acceleration of the ball. In other words, in the expression vT = mg/b, the real weight mg of the ball is to be substituted by the reduced apparent weight.